Experience the adventure of fresh-water fishing in the Everglades on this 4.5-hour airboat fishing excursion. Cut through the sawgrass on a sleek airboat before stopping to fish. Equipment, snacks, and beverages are included. Choose a morning or afternoon departure and meet your captain for your fishing adventure. Board the airboat and cruise through the Everglades to the fishing spot. 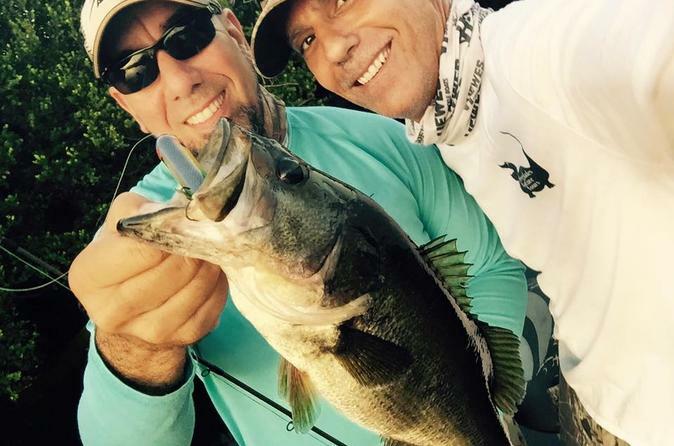 When you reach the spot, choose between live bait or flies for your rod. Learn tips and tricks from your captain as you cast your line to try and catch a largemouth bass, bowfin, pickerel, gar, tilapia, oscar, perch or bluegill. After a few hours of fishing, cruise back on the airboat to the departure point where the excursion concludes. This adventure is fun for all ages and skill levels.